Poisson regresyonunda, akar populasyonu için relatif risk tahminini esas alan bağımlı değişken sayıma dayalı olarak elde edilebilir. Bu tip sayıma dalayı olarak elde edilen akar populasyonu için bilinen doğrusal regresyon yöntemi kullanılarak risk tahmini oldukça zordur. Böyle durumlarda, Poisson log doğrusal regresyonu oldukça uygundur. Bu çalışmada, enfekte edilen bitkilerin olma oranları iki farklı buğday çeşidi ve dört farklı lokasyon tarafından tanımlandı. Çalışmanın veri seti; iki farklı buğday çeşidi (Triticum aestivum L. and Secale cereale L. (Poaceae) ve dört farklı lokasyon (Muradiye, Ahlat, Erciş, Doğu Beyazıt and Iğdır) kullanılarak iki yönlü tablo halinde verilmiştir. Referans parametresi olarak çeşit için Triticum aestivum ve lokasyon için ise Muradiye alınmıştır. Secale cereale’de bitkilerin enfekte olma riski Triticum aestivum’dan 1.245 kat daha yüksek olduğu saptanmıştır (p<0.05). Iğdır lokasyonundaki bitkilerin enfekte olma riski Muradiye lokasyonundan 1.101 kat daha yüksek olduğu saptanmıştır (p>0.05). Poisson log doğrusal regresyon modelinde bağımlı değişken sayımla elde edilen risk oranı ya da relatif risk biçiminde tanımlanabilir. Bu nedenle Poisson log doğrusal regresyonu bu tip iki yönlü tabloya dönüştürülebilen veriler için oldukça etklili bir yöntemdir. Burada, iki yönlü tablonun oluşumu için çeşitler ve lokasyonlar kullanılmıştır. In Poisson regression, the dependent variable of the mite population relative risk assessment can be estimated as based on countable data. Due to disappearing data and numerous uncountable values of the mite population it became difficult to evaluate the risk factor by linear regression methods. The assessment of variable features of mites depending on conditions is very suitable for Poisson regression modeling system. In the this study, the occurrence of rare events such as the occurrence ratio of infected plants was defined by eriophyid mites on two wheat varieties and four different localities. 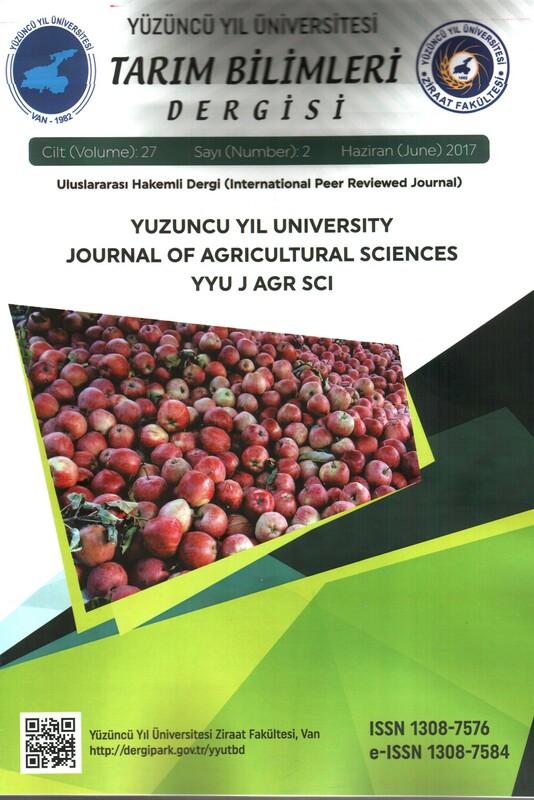 The study was constructed by two way possibility table depending on plant varieties (Triticum aestivum L. and Secale cereale L. (Poaceae) with four locations (Muradiye, Ahlat, Erciş, Doğu Beyazıt and Iğdır). The reference parameters were Triticum aestivum for varieties, and Muradiye for location, respectively. The risk assessment of infected plants for Secale cereale is 1.245 times higher as compared to Triticum aestivum and this difference was found statistically significant (p<0.05). The risk of infected plants for Iğdır location is 1.101 times higher as compared to Muradiye location (p>0.05). In the Poisson log-linear regression, the dependent variable is a risk ratio or a relative risk can be estimated as well as countable data. Thus, Poisson log-linear regression model is a very effective method for analysis of two-way contingency table. Two-way contingency table is created considering the eriophyid mite infection ratio depending on location and varieties, respectively. Agresti A, 1997. Categorical Data Analysis. John and Wiley & Sons, Incorporation, New Jersey, Canada. Amrine, J. W. Jr. 2003. Catalog of the Eriophyoidea. A working catalog of the Eriophyoidea of the world. Ver. 1.0. <http://in- sects.tamu.edu/research/collection/hallan/acari/eriophyidae> (accessed 1 July 2013). De Lillo, E., C. Craemer, J. W. Amrine, Jr, and G. Nuzzaci. 2010. Recommended procedures and techniques for mor- phological studies of Eriophyoidea (Acari: Prostigmata). Exp. Appl. Acarol. 51: 283–307. Denizhan, E., W. Szydło, and A. Skoracka. 2013. Eriophyoid studies in Turkey: Review and perspectives. Biol. Lett. 50: 45–54. new species, new distribution reports and an updated catalogue. Zootaxa, 3991(1), 1-63. Eye, A. V., Mun, E. Y., 2013. Log-Linear Modeling. John and Wiley & Sons, Inc., Hoboken, New Jersey, Canada. SAS, 2017. SAS/Stat Software Hangen and Enhanced, SAS Institute Incorporation, USA. Yeşilova A, Kaydan B, Kaya Y, 2010. Modelling insect-egg data with excess zeros using zero-inflated regression models. Hacettepe Journal of Mathematics and Statistics, 39(2), 273-282. Yeşilova A, Denizhan, E, 2016. Modeling mite counts Using Poisson and negative binomial regressions. 25(11), 5062-5066. Fresenius Environmental Bulletin.